Vin Kane received an Order of Australia Medal last month. Picture: Supplied. VIN Kane, is a prime example of what can be achieved in one’s post-retirement stage of life. He received an Order of Australia Medal last month as part of the Queen’s Birthday honours following three decades of service with the St Vincent de Paul Society in Canberra. Remarkably, the Ainslie pensioner earned the award during a stage of life where most are playing golf, travelling or taking it easy in other ways. He says there is nothing really special about his involvement with the Society, although since joining the Braddon conference in 1987 he has gone on to make more than 7000 visits to households and homeless people in the city and inner north. “My achievements are just a representative sample of the service that members give all over Australia, and indeed wherever the Society exists in the world,” the current Braddon president said. “I see it simply as service that goes with being a Christian, although I do know that some of us respond to the challenge of service more easily than others. Originally from Melbourne, Mr Kane says his appreciation for the charity coincided with the family’s move to Canberra. 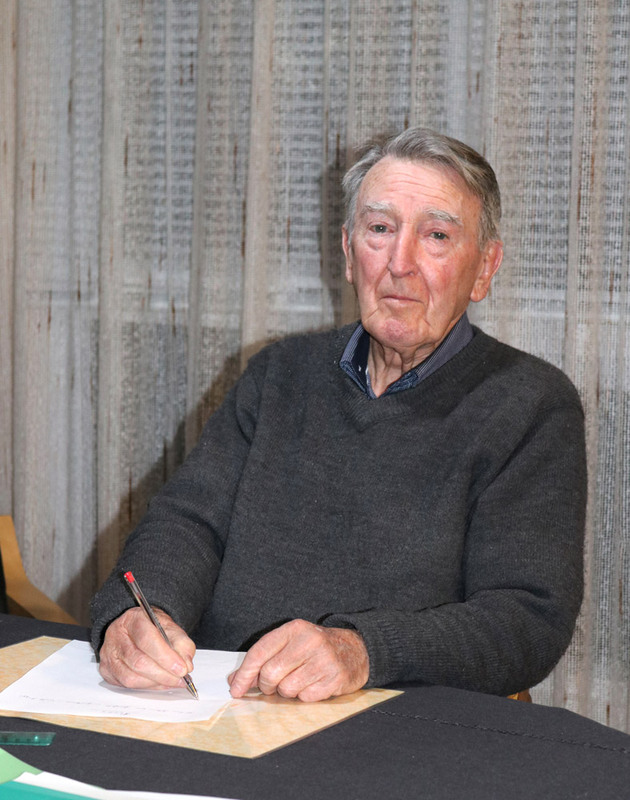 “Early in 1961, after ten years of a happy and fruitful married life, I had a mid- range position as a clerk in the old PMG Department in Melbourne, a wonderful wife and six healthy children, all accommodated in our two bedroom house in Box Hill,” he said. “I thought I should try to do better to provide for the growing family. “So I began a program of weekly visits and petitions to Our Lady of Perpetual Succour in Melbourne’s St Francis Church in the city. Mr Kane’s move to a position within the Public Service at the National Capital Development Commission in Canberra in mid-1961 provided fresh opportunities for all the Kane family – housing, schooling, Church, tertiary education, friendships, maturity – even another child – Jaki in 1969. Jaki, is known to many in the Archdiocese as the director of music at St Christopher’s Cathedral. “In light of all that good fortune something in return was called for, so I took early retirement in 1987 and joined the St Vincent de Paul Society,” he said. As a long-time parishioner of the Central Canberra Parish, Mr Kane recalls how in the 1970s Fr Tom Wright, a former parish priest of Braddon handed over to him the responsibility for the re-settlement in the northern part of Canberra for the first wave of refugees that came to Australia from behind the Iron Curtain in Eastern Europe and from war-torn Vietnam. “With two other Braddon parishioners, who have since gone to their eternal reward we pestered estate agents for temporary accommodation, businesses for jobs, school places for the children; and Vinnies and the Salvos for clothing and bedding,” Mr Kane said. In congratulating Mr Kane on his award, Warwick Fulton, the St Vincent de Paul Society President of the Canberra and Goulburn division, noted that the Braddon Conference is the second oldest in the ACT, having been formed in 1936, just a few years after the St Christopher’s Conference in Manuka. Former Society president in Canberra and Goulburn, Bob Wilson also expressed his gratitude to the OAM recipient while Mr Kane’s own family held a celebration gathering recently. January 20, 1944: Mr Kane received a letter from Br Williams, a Christian Brother teacher at Our Lady of Mount Carmel College, Middle Park in Melbourne. In the letter, Br Williams extends his appreciation to Mr Kane for his outstanding efforts in connection with setting up the library and says he was indeed fortunate to have had such a willing, self-sacrificing and cheerful helper. March 15, 1963: Mr Kane receives a letter from the Australian Secretary to the Queen conveying the gratitude of Her Majesty and The Duke of Edinburgh for the part he played in connection to her earlier visit to Canberra. June, 2018: Recipient of Order of Australia.